Wind-up records has had a great deal of luck when it comes to introducing new bands into the rock scene. In the last year they have brought Seether, Evenescense, and now Big Dismal into the mainstream. 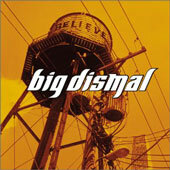 Big Dismal is from the South, which is quite evident in their sound and singer, Eric Durrance’s slight southern drawl. While these boys are not country they aren’t quite rock either, or at least of that nu-metal persuasion that has become so popular as of late. Obviously with a name like Big Dismal this record is the type of disc you save for one of those rainy days. Especially if you are feeling lonely, throw on “Hanging On”. The sadness found in this song, such things like ” Not that these guys are anywhere near emo, actually its quite the opposite. The sanding hope found in lyrics like “to love me when I’m feeling down/when no one else will come around” or the inability to let go like ‘”I can’t take anymore/Is this worth trying for/You keep me hanging on and on/You keep me hanging on” might make you think that this another emo record, but far from it. The guys are so good at being hopefully depressing while keeping it in line with rock and roll instead of complaint rock, their considerably heavier label mate Evanescence’s singer Amy Lee even found it appropriate to lend her vocals to the track entitled “Missing You”. Examining the whole as parts, the Big Dismal guys’ strength lies in their musical capabilities as well as their lyrical emotional gravity. Singer Durrance has been compared to vocalists like Scott Weiland or Eddy Vedder, and although he lacks their strong poetic approach he carries quite a tune. Durance may provide simple words but he delivers them with emotion. Additionally, you can listen to the whole album with out skipping songs because there is enough variety. They have big guitars, clean chords, and a melodic structure in line with Stone Temple Pilot’s’ first album Core. These guys aren’t doing anything new and futuristic, they just are going to the roots of rock. And there is nothing wrong with creating a simple rock record. Isn’t that what rock is all about anyways? Simplicity. The only problem these guys run into is that they are too close in line with Creed. Not that their music is as over-produced or repetitious. Their heavier references to Christ like” I don’t want to wear that crown” in Too Pretty, as well as the fact the song Remember has definite spiritual overtones seeing as it is a song about the ‘sacrifice’ Christ made. Additionally, a lot of their effects and the mixing of the cd sounds pretty similar to Creed’s two last cds, lending a strange artificial element to what sounds like it suppose to be four guys playing in a barn. Apart from the Creed/ Christian rock thing, this is a pretty strong record. They have some merit of musical talent but as far as image content is concerned, they are about as exciting as your grandmothers baptism. Time will tell if they are worth a viewing but right now they are worth a listen to.